Excited to be teaming up with Gorjana & Griffin over the next few weeks to share my favorite pieces from their new Fall Collection. I really think this is one line I could indulge in every single piece. Delicate, minimal, and gold to perfection. I love this look as well! Such a great bag, love the flowers! I have similar pants from Loft, and I love them! They’re so comfy and chic! Love the entire look also! LOVE the outfit and the way you styled all the rings/necklaces. So pretty!! Perfect outfit! I love those sandals! Love the effortless look! 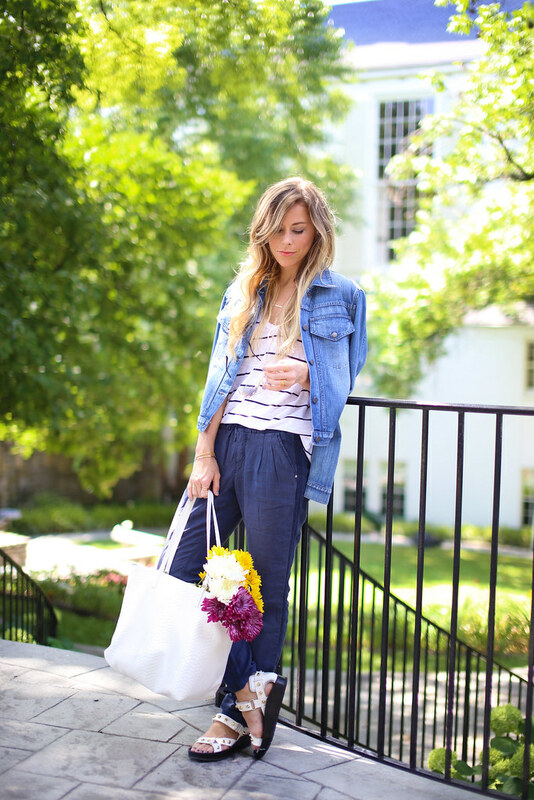 Such a cute outfit to run errands in! Fantastic rings and top! You look gorgeous! minimal is always best! I love the pieces you’ve chosen here. they would pretty much go with everything and I love how understated they are. I love Gorjana’s simple and delicate accessories! I was so excited to see that they’re available at Nordstrom Rack now too! I absolutely love your style! Dressed up or casual, you always put things together so flawlessly. Love the outfit and the charming details. Loving your nail color!! May i ask what it is called? Hi, love the pants, perfect amount of slouchiness 🙂 Can you tell me what size pants you are wearing? thanks! I love your outfit and your jewelry. You are looking stunning…………love it ! 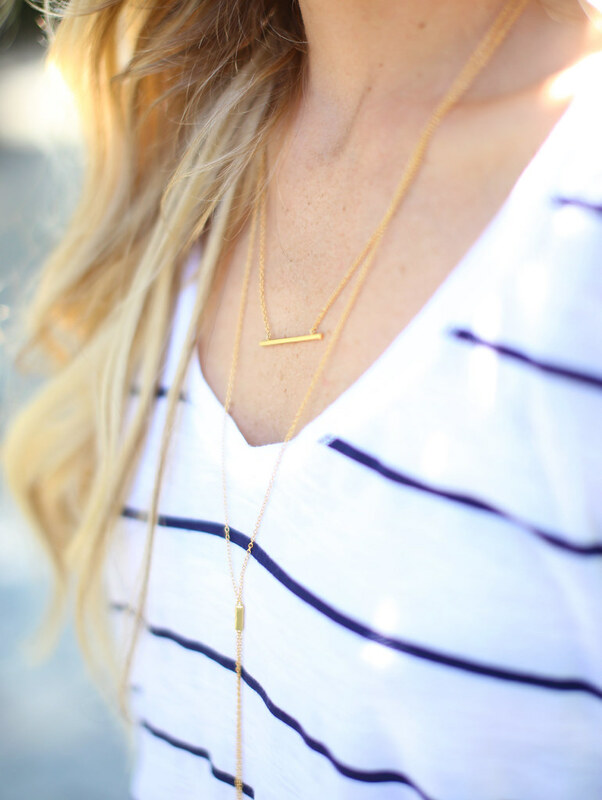 I’m obsessed with the delicate, layered jewelry! That jewelry is so dainty and gorgeous, I want all of it! Love this casual look, too. You look gorgeous! Love Gorjana. One of the few places you can find some amazing pieces of modern gold jewels. I love Gorjana jewelry, it’s so delicate and feminine. It’s the perfect touch to your casual outfit! Though this outfit is casual a first glance, there are efforts that have been made and not missed. There is an unstated chic factor that I really like. Clearly styling doesn’t have to be completed. Very nice. Love love love all of the jewelry! Such a fan of the stacks of gold. 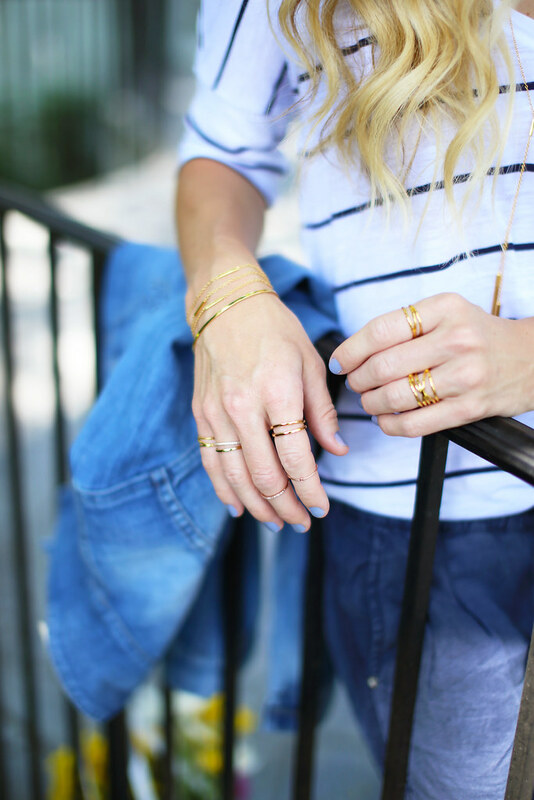 I absolutely LOVE Gorjana and the way you layered all your jewelry! Perfectly chic with your outfit! 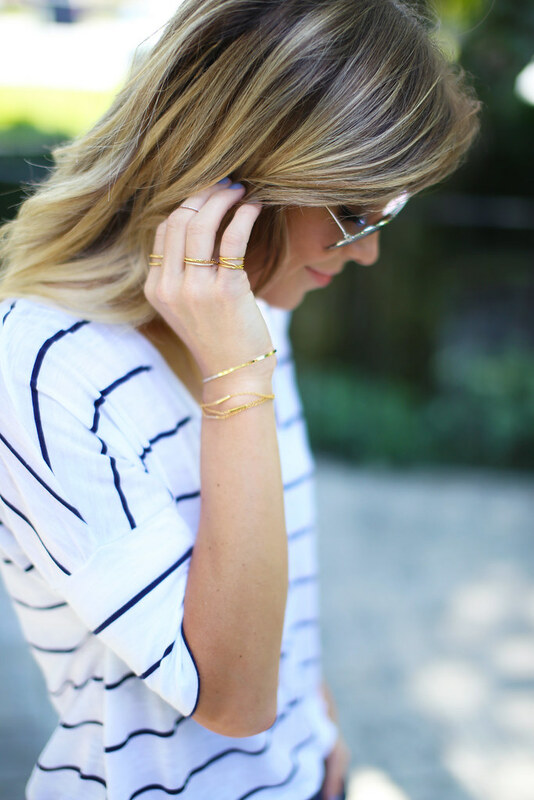 Gorjana layering and stripes…could it be any more perfect!! Love the essence of this. You look beautiful and your hair is seriously amazing! amazing outfit! Love the accesories! clarity in your post is simply cool and i can assume you’re an expert on this subject. do it! Your writing taste has been surprised me. Thanks, very nice post. Waauu, I love this look as well! Such a great bag, & i like your nail sist.